I love this book by team Obama! 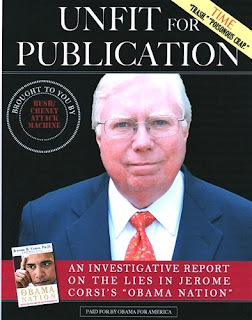 Not only repudiate the Repuglican smear-machine (Corsi, an anti-Catholic nutcase who believes the government is covering up 9/11 and who claims Pedophilia is OK with the Pope, is the same author of the Swift-Boat attack on Kerri), have fun doing it? Now, if only he could get the story out that the #-1 status of Corsi's libel of Obama is due to pre-orders by partisan Republican groups. More sarcastic agit-prop from team Obama, please.